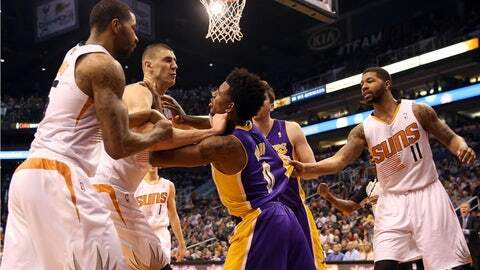 Nick Young reacts after a flagrant foul by Suns center Alex Len. NEW YORK — Los Angeles Lakers guard Nick Young was suspended one game without pay by the NBA on Thursday for throwing a punch at Phoenix’s Goran Dragic in the first half the previous night. Suns center Alex Len, ejected after receiving a Flagrant 2 foul against Young, was fined $15,000, and teammate Marcus Morris was fined $25,000 for his involvement. Young, who threw the punch with 7:33 left in the second quarter of the Suns’ 121-114 win, will miss the Lakers’ game at Boston on Friday night.